Lisa Krikawa was asked to participate in MJSA's annual Mystery Box Challenge. Three jewelry designers are given a box of mystery items and they have four weeks to create a custom piece from the materials provided. This year, the items were a sheet of sterling silver, a sheet of titanium, a silver mesh chain, a round chrome diopside and two oval garnets. Her design is featured on the cover of February's MJSA Journal. In this Special Edition of the MJSA Journal, some custom jewelers, including Lisa Krikawa, are interviewed for the article, Handling the Holidays. They are asked how they handle the holiday rush and anticipate their customer's last-minute needs. In this article in the Arizona Daily Star titled 'Internet a blessing and a curse for local jewelers' , the complications and benfits that go along with selling jewelry online are discussed by several Arizona jewelers including Lisa Krikawa of Krikawa Jewelry Designs. Check out the full article here! In the Special Insert Article titled Is "Custom" a Dirty Word?, Lisa Krikawa is interviewed and explains why she avoids using the word "custom" and how that helps her connect with customers. Our local paper covered our moving into the site of one of Tucson's first jewelry stores Downtown! Ring designer Lisa Krikawa was interviewed at 21 E. Congress St., which used to be Daniel's Jewelers. Read the full article and see some more pictures of Lisa in the new space. We are delighted to see our client's wedding featured in The Knot's Gay Weddings magazine! Congrats to Carol and Jillion, who got a White mokume band with diamonds. Find the whole magazine here. According to Lisa Krikawa, a good gift is meaningful to your loved one and created with respect for the earth. Whether you are gifting jewelry or not, you will find her advice helpful! Read the editorial in full. Krikawa's Shooting Star Mokume Engagement Ring is featured in an article about CAD and 3D printing in this industry magazine. Lisa also pitches in on what it takes to be a CAD modeler making intricate designs. Read more. Our CAD modeler, Pat Swartz' Live! Ring made the front cover of this issue. In "The Light Side" the magazine features rings that are lightweight and/or hollow. In the article, our caster is interviewed on the process. In "Virtually Possible," MJSA interviews different jewelers, including Lisa Krikawa, on how to build, organize and sell a virtual inventory of CAD designs. View the virtual version of this magazine. This brand new publication highlights extraordinary women in the community. The "Grandma's old diamonds are good as gold" article interviews Lisa on re-using older diamonds in new jewelry, whether it is a custom-designed ring, or less complex pendant or pair of earrings. This book, by Renee Newman, G.G., explains how to test, buy, sell, and care for jewelry with precious and alternative metals. 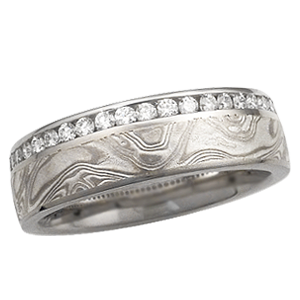 A Platinum mokume gane wedding band of ours is featured in the wood-grain metal section. This MJSA publication features Krikawa as one of 30 acclaimed designers and jewelers who reveal what tools they love in the workshop. Krikawa Jewelry is featured in JCK Magazine again! In their "Silver Chic" feature, Lisa talks about the creative uses of sterling. Krikawa's Family Circle Birthstone Pendant is shown in the feature. See the whole article to learn about how Krikawa and other contemporary jewelry artists use sterling. Lisa was featured as one of four Innovator Retailers in September's Creative Class feature. Lisa discusses what it means to be socially responsible and the challenges that come with it in the jewelry industry. Read the interview to learn more about Krikawa's responsible jewelry practices. Also see the entire feature at JCK. In a Special Report, "Going Virtual," MJSA asks three jewelers how they use virtual inventory. Lisa talks about how virtual prototypes from Stuller, Inc. are incorporated into Krikawa's custom jewelry business. Design & Repair Specialist Nancy is interviewed in the "I Love My job!" feature in the Sunday job classifieds section of the Arizona Daily Star newspaper. Nancy discusses her experience in the jewelry industry and what it's like to work at Krikawa. She is pictured holding a computer with Krikawa's 3D virtual ring design program. Read the full interview. Lisa Krikawa was featured on the front cover of this new MJSA publication! The main article, "Stage Craft," features select stores which have inspiring environments for custom jewelry design. Krikawa's new showroom, equipped with ample seating and a beverage center, is used as an example of a comfortable and hospitable space for clients. Also featured is a photo spread of our gemologist Jackie with the education tools and samples provided in custom ring consultations. Click on the upper right image to see the full list of what you may expect when you design your dream ring. Krikawa's Double Delicate Leaf Unique Engagement Ring with Halo was featured in Engagement 101's The Ultimate 2011 Ring and Proposal Guide. The spread shows rings that make "bold statements" like the engagement ring on singer Fergie. Click on the image to the right for a closeup, or browse through the entire virtual magazine. Flip through the whole magazine online at Tucson Guide Magazine. This issue of MJSA features an article by Lisa Krikawa called "Simply Put: Pave Setting for Beginners." She explains pave setting step-by-step with hand-drawn illustrations. She also presented this as a demo in the MJSA program at the 2010 AGTA GemFair in Tucson. The bi-monthly Diamond World is "Asia’s oldest publication on precious trade" and "is an international magazine for diamonds and diamond-studded jewellery sector." This issue puts on a spotlight on palladium as an alternative to more common precious metals. Lisa explains the benefits of using palladium in her custom made engagement rings and unique wedding bands. The luxurious Queen of Everything Engagement Ring is featured in the Celebrity Trends section. Its black diamonds are exemplified as a good choice for those seeking something unusual or a little rock-and-roll. This newsletter is a part of the Where Guestbook distributed at Tucson hotels. The Winter issue has a spotlight on Krikawa Jewelry Designs. It highlights Krikawa's status as an international custom jeweler, skilled in the art of mokume gane, and invites readers to visit our new location in St. Philip's Plaza. This issue of the lifestyle magazine Haute Living has a feature on Krikawa in its Haute Necessities section. The spread is full of images of our custom earrings, necklaces, and more. Krikawa's Musical Symbol Wedding Ring was featured in Inside Weddings. This issue interviewed Lisa Krikawa on the hydraulic die press and its uses in custom jewelry. Lisa Krikawa explains the Do's and Don'ts of choosing a ring. Destination Weddings was an insert in USA Today. In MJSA Journal, September 2009 issue, the publisher was exploring ways that the jewelry industry could rebound from the recession. He interviewed Lisa Krikawa and ended up with a very moving article. In Bridal Guide, May 2009 issue, a Krikawa ring is featured in the article titled "The Rock Shop," as a ring for the Athlete. This is our Mokume Flush Stone Engagement Ring with Winter Mokume. Click on the article on the right for a full read. In this Celebrity Lifestyle issue, Salma Hayek's three stone engagement ring with trillions is highlighted. A Krikawa engagement ring is featured as a "trillion treasure." That unique ring has a round blue sapphire with trillion diamonds, and Platinum mokume; view more images on its style page. Solitaire International is "the Indian gem and jewellery magazine." In the April 2009 issue, there is an interview with Neill Swan of Johnson Matthey, our palladium supplier. The article is filled with images of Krikawa's luxury jewelry. The Jonas Brothers wore their platinum and diamond pins by Krikawa at the premier of their new Disney 3D movie. We had fun video taping the process of making the pins. The video: "Making of the Jonas Brothers Pins" coming soon on You-Tube. Stay tuned! Photo by Kevin Winter/Getty Images. Pictured: Platinum, 24k gold and over 70 diamonds in this sparkling custom Jonas Brothers pin. In Wedding Dresses Magazine, the 2009 Official Bridal Style Guide, a Krikawa Carved Curls Engagement Ring and Enhancer is worn on the cover model. A close-up of the ring is shown on the table of contents page, right. Tucson Lifestyle Magazine is "is the first stop for food, dining, travel, resorts, hotels and golf courses." This issue's "Flights of Fashion" spread, photographed at the Tucson International Airport, included models wearing unique cocktail rings by Krikawa Jewelry Designs. Engagement 101 Magazine, touted as the magazine to read before you get engaged, included our Carved Curls Engagement Ring with Enhancer in a feature article titled Red Hot Love. The auburn haired beauty showcased the ring set with style! For a closer look at the ring set, check it out on our site. The national engagement and bridal publication, Engagement 101Magazine, featured two of our colorful rings in their current issue. The luxury Juicy Light Engagement Ring with a gorgeous Padparadscha pink sapphire is featured as an editor pick in the article Rings of Pink and Gold. The contemporary Mokume Embrace Engagement Ring, with a brilliant blue sapphire and channel of diamonds, is included as a Celebrity Trend in the article Sapphire Style. Engagement 101 Magazine included an article on mokume gane, title Twisted Love, in their 2009 issue. Author Staphanie Taylor aptly pointed out that "every ring, like every romance, is divinely different" and pointed out that when you commission a mokume ring, "you are not only gaining a piece of jewelry, but also an exquisite piece of art." Our handmade Mokume Curls Engagement Ring was featured in the article. Our appreciation goes to Stephanie for an informative article. Lisa is a featured designer in the current issue of Engagement 101 magazine. We were able to highlight several of our rings including the Delicate Leaf wedding set. We also received a premium position on the Engagement 101 website with the Mokume Wave Engagement Ring. Elena Mauer of Bridal Guide magazine, a leading publication for those getting engaged and planning a wedding, wrote a story on the custom wedding ring design process. She chose a Krikawa couple, Steve and Eliana Costello, to feature as an example of a couple who underwent the process and eloquently described Steve and Eliana's journey to realize their one of a kind Krikawa ring. We are grateful to Elena for using Krikawa as an example for the story, and to Steve and Eliana for allowing their story to be told. Winners of the 2008 Diva Award in the Everyday Bridal Ring Suite category, sponsored by Platinum Guild International, Delicate Leaf bridal set. We scored times two in the November issue of LA Direct magazine. This trendy magazine highlights the hip scene in Los Angeles with the latest on fashion, celebs and lifestyle. Samantha Harris, Dancing with the Stars co-host and E! News correspondent, wore our Earth Earrings for a feature article. Our Juicy Liqueur engagement ring was also included as a featured product. Krikawa was a part of the fun in LA as fashion week kicked-off with a party presented by Planet Funk at the Kress Supper Club. This Red Carpet event was sponsored by LA Direct magazine and the magazine's Margarita Hirapetian introduced each celeb to the paparazzi. Margarita held her own next to some of Hollywood's trendiest by wearing our fabulous and blingy earth symbol pendant. The event was hosted by the gorgeous Annalynne McCord of 90210. Pictured: (left) Margarita Hirapetian, wearing our brilliant earth symbol pendant, with Ryan Eggold of 90210. (right) Samantha Harris and Margarita Hirapetian. Samantha covered the event for E! News. The national publication, Bridal Guide, is an indispensable reference for anyone planning an engagement and wedding. With hundreds of pages featuring beautiful gowns and jewelry, wedding planning advice and tips, make-up looks, and soooo much more, every bride-to-be will want to get each issue. We had a pair of black and white pearl earrings included in a piece entitled "Mix and Match: The Latest Looks for Pearls Blend Colors and Varieties." JCKstylepresents fashion-forward looks that are at the intersection of fashion and jewelry. Here, you'll find the latest from the runway and Hollywood, as well as the hottest fashion trends. We had our High Tea Cocktail Ringincluded in a fashion shoot that interpreted iconic images by Richard Avedon, one of the fashion world's most celebrated photographers. We are honored to be included in this tribute to this classic icon. Krikawa was invited to participate in Platinum Guild International's Emmy Award Jewelry Review. The Platinum Guild hosted a three day open house where celebrities, celebrity stylists, broadcast media, and editors and producers can select jewelry to be worn on the Red Carpet for the Emmy Awards. Pictured: Cheryl Hines of "Curb Your Enthusiasm" checking out some unique Lifedrop Earrings. Modern Jeweler, a Cygnus publication, covers product and trends for jewelry retailers and has been serving the industry for 108 years. In the Report section, the 2008 Women's Jewelry Association DIVA awards are covered. Krikawa won first place in the everyday bridal ring suite category. A picture of the winning Delicate Leaf set is shown. The Stuller Standard is an industry publication that keeps jewelers and shop owners informed on industry trends and technological advances. They had a beautiful write-up on the 2008 MJSA Vision Award Winners and included a picture of our award-winning Juicy Liqueur engagement ring. Juicy, as we affectionately call it, won first place in the Mokume-gane category. Our jewelry was the focus of a story on wedding ring trends in the Summer/Fall issue of Tucson Bridal. Our rings were used to illustrate four of the five trends outlined in the story: colored stones, semi-bezel settings for active lifestyles, diamond accents, and reinterpreting vintage style. This was a great opportunity for us to showcase a wide variety of our styles in one article. Thanks Erin Burt for an informative and creative article! We were the featured jeweler on Good Morning Arizona's "Wedding Trends--Go Green" story coordinated by Arizona Weddings Magazine. Arizona Weddings chose to feature our company as our jewelry is locally made and we promote conflict-free diamonds and fair trade gemstones. Some of you may have heard us mentioned on your local television station as we were a part of JIC's satellite media tour. The topic, "Bridal Jewelry Trends", featured some of the hottest trends for brides today. Our Unity Wedding Setwas included as a modern example of a way to connect his and her wedding bands with symbols. The MJSA/Journal is a publication for jewelry manufacturers, from large operations to small shops. With information on industry news, trends, new products, and technical advice, the journal is a must-read for anyone producing jewelry. Lisa was interviewed for the July issue about her inspiration for the Brilliant Cathedral engagement ring. The article gives the reader a good understanding of Lisa's design choices combined with her technical expertise. The JCK Show Daily, a comprehensive tabloid published during the JCK Las Vegas show, covered the award ceremony for the DIVA Awards. While there were five first place winners in different categories, we were one of two artists that had our jewelry featured in the story. Pictured: a computer rendering of the Delicate Leaf engagement and wedding ring set featured in JCK Show Daily. We knew we were being included in an article in the spring issue of Tucson Guide, but we were thrilled when we learned we were going to be on the cover! Rebecca Boren wrote a fabulous article on local jewelers and Tim Fuller took some amazing photos of our rings. Tucson Guide gave us a framed poster of the cover in time to show it off at our Alchemy Party in February. We truly were feeling like Rock Stars! Click on the thumbnails to read an excerpt of the article and get a glimpse of the Juicy Liqueur and Queen of Everything mokume gane rings. We are very excited that two of our engagement rings, Queen of Everything and Mokume Borealis, have been included in the recently published book, 500 Wedding Rings: Celebrating a Classic Symbol of Commitment, from Lark Books. The book presents remarkable works of art from around the globe that capture the spirit of committed relationships. We are honored to be among those represented in this beautiful, full color, elegantly designed publication. Krikawa Jewelry Designs was recently featured in an article on web-based businesses in the Business section of the Arizona Daily Star, Tucson's morning newspaper. We're thrilled that the local business community is acknowledging our success. Click on the thumbnails to read the article. Our local newspaper, The Tucson Citizen, covered Krikawa's hitting the $1 million sales mark! The full article can be found in their archive. Being an early champion of palladium, Lisa was interviewed for this article, "Palladium, the next hot white in the States?" She explains the different benefits of using palladium, from the designer and jeweler's perspective, to the client's perspective. This publication is known as the "premier resource for the Canadian jewellery industry." A spread called Creative Canucks features MJSA Vision Award Design Competition winners. Lisa's Mokume Amulet Eye Brooch/Pendant won first place in the mokume gane distinction category. A separate article, Lovely Lockets, showcases Krikawa for its handcrafted lockets. Lisa is interviewed about the sentimental appeal and technical precision involved in lockets. Zegarki & Bizuteria (watches and jewelry) is the leading Polish watch and jewelry trade magazine, addressed to Polish wholesalers and retailers, as well as producers, operating in the watch and jewelry business. In this issue, Krikawa is featured in the main article called "Mokume Gane: Jewelry in the Spirit of Bushido." The piece is full of images of unique mokume engagement rings and other jewelry by Krikawa. Niche is a magazine "connecting art galleries and craft retailers with the finest wholesale crafts, handmade gifts and decorative art objects made in artist studios." Krikawa won a 1999 Niche Award for the solid yellow gold Voodoo Locket, pictured in their spread of award winners.